Grab someone special and take advantage of every perfect outdoor moment with our Berlin Gardens Poly Casual-Back Porch Swing. 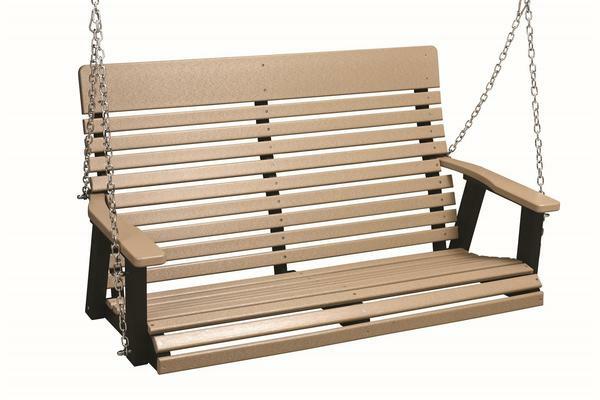 Handcrafted with a gorgeously contoured back and seat, this porch swing will leave you feeling relaxed and rejuvenated. Add the optional Sunbrella cushions and throw pillows to add a touch of your unique style and increase the comfort of your new swing. Add our Vinyl A-Frame or Arbor to place your swing in your favorite outdoor spot and take full advantage of any location. Our Casual Back Porch Swings are great for commercial use, allowing your patrons the perfect place to sit and relax while enjoying your business. Backed by a five year warranty, our Berlin Gardens Furniture is a great investment for your outdoor decor!